July 28, 2008, 1:28 p.m.
On any given Sunday, the Dodgers now sport four veteran two first-name players in their lineup. Take for example, yesterday. The newly initiated Casey Blake gets the third base job, over Andy LaRoche and the other Blake, DeWitt. And was that Blake part confusing or what? With Russell Martin behind the plate, Juan Pierre back in left field, and Jeff Kent covering massive territory at second, that's a serious contingent of two first-names men to be contended with. Too much for the Washington Nationals, quite obviously. We'll just see if the Giants and Dbacks can respond this week. I say they fold like a cheap left-handed pinch hitter, fresh off the disabled list. Both clubs are better than the Nats, but Joe Torre still has Cory Wade in his deck of cards, and by the next time the division rivals face-off, perhaps Brad Penny. OK, fluff aside, props to Ned Colletti for the Casey Blake trade. Credit where credit is due. It doesn't excuse Colletti's 2008 negligence, especially regarding the of-little-importance shortstop position, but credit where credit is due. He won't keep his job with anything less than a pennant because of Andruw Jones and Jason Schmidt, but credit where credit is due. Yes, the Dodgers gave up two fine young players in Jon Meloan and Carlos Santana (your guitar joke here), but a stockpile of others remain. With Blake coveted by several clubs, this wasn't going to be a simple salary dump. You want something, you have to spring for it. The "he's a rental" argument cuts both ways. In Blake, you get a guy playing for a new contract, without committing beyond October, both of which are usually good things. Dealing for someone like Jack Wilson, and his $7 million salary in 2009, brings another set of advantages and disadvantages. I'll take Blake over Wilson and be quite happy, thank you very much. Plus, RBIs people, RBIs. And runs, big runs, any way you and score them. Homers are overrated. Blake drives guys in, and hits in the clutch. Maybe not throughout his entire career, but he is this year, and that's what matters now. Pre-trade, Blake's splits look like this: Post All Star break: hitting .350; runners on: .336; bases loaded: .600 (.600! ); scoring position: .398; scoring position, two out: .318. He's been in a couple of pennant races, and after struggling in the four-game American League Division Series against the Angels last year, he came back to hit .346 in the seven-game Championship Series against Boston. As for LaRoche, who's to say? He might've been on the precipice of greatness, a day away from a monster breakout, sure, but he might just as easily be a year or two away from resembling even as much as a major league-ready regular. We'll never know, but in Andre Ethier, Matt Kemp, James Loney and Russell Martin, four young guys (recall please, the word "kids" is out here) in the starting eight is enough for now. Torre re Blake: "He's a little further along than [DeWitt and LaRoche] at this juncture." He's a lot further along, actually, but OK. Joe's entitled to a moment of consideration. Since it's in contrast to his stubborn faith in undeserving veterans like Andruw Jones and Mark Sweeney, perhaps we should just cross our fingers, and hope for the best lineup we can get. But I wonder if Ethier knows he's required to hit for the cycle Monday to play another day. Come to think of it, that might not guarantee a thing. Two cycles Monday, Andre. Two cycles. You can do it. Who Goofed? Along with an article on the trade, Jon Heyman and SI.com posted this photo of Casey Blake. 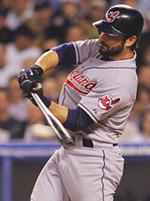 So, if there are any Indian fans out there who can make the call, was this Blake's one career at bat as a lefty, or is this some other bearded Cleveland player? Please let us know. New York Minute, Part Deux: How is it that the Mets keep getting production out of Dodger leftovers, and it never works the other way around? Marlon Anderson, I understand. Good guy, good player, and Colletti gave him away for nothing. Lame. But Jose Valentin, who the Mets just loved, and Fernando Tatis? !